Cars, buses, trains, and planes, Oh My! Do you have a little one fascinated with all things with wheels? If so, then this is the print for you. The top part of the design is where all the action takes place. Cars, buses, trains, planes and helicopters are all there in a variety of colors to make it easy for decorating coordination. The bottom part of the pattern is a striped print in coordinating colors. So versatile when decorating. A gray with yellow "road" band ties the two patterns together. A blue and white circle label showcases the airplane and allows for personalization of your choice underneath. 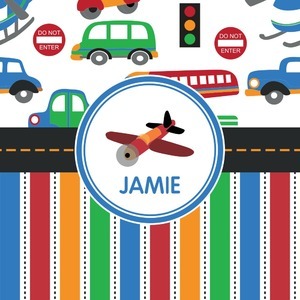 You can customize further by picking any of the transportation pictures in the pattern to place in the label. Just let us know what you want.